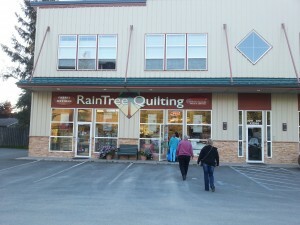 Our first port of call on the cruise to Alaska was Juneau. 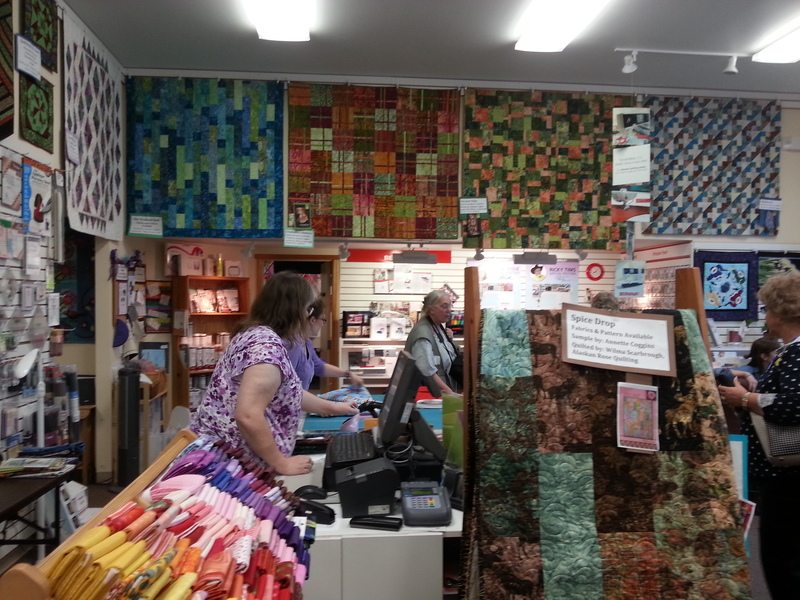 Several of us opted for a whale-watching boat trip with a stop at the quilt shop on the way back into town. 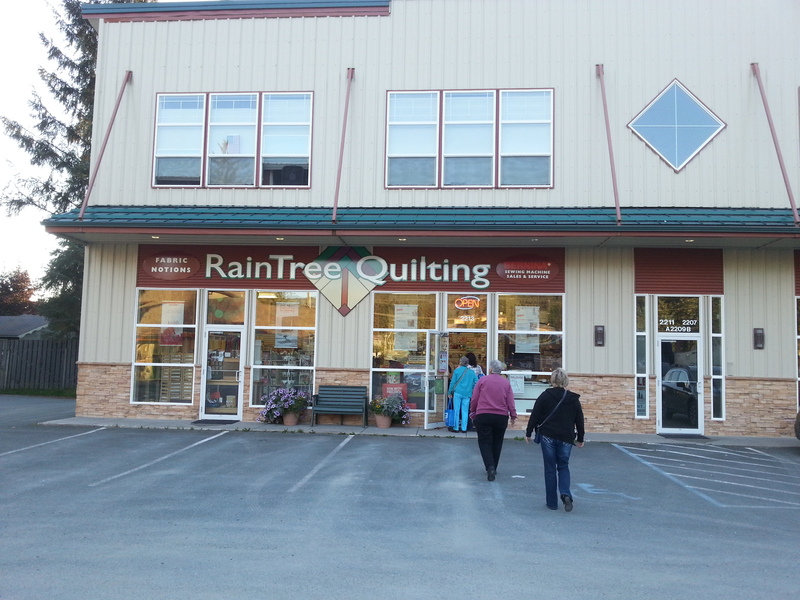 Rain Tree Quilting is on the outskirts of Juneau at 2213 Dunn Street (off Old Glacier Highway across from Frontier Streets). 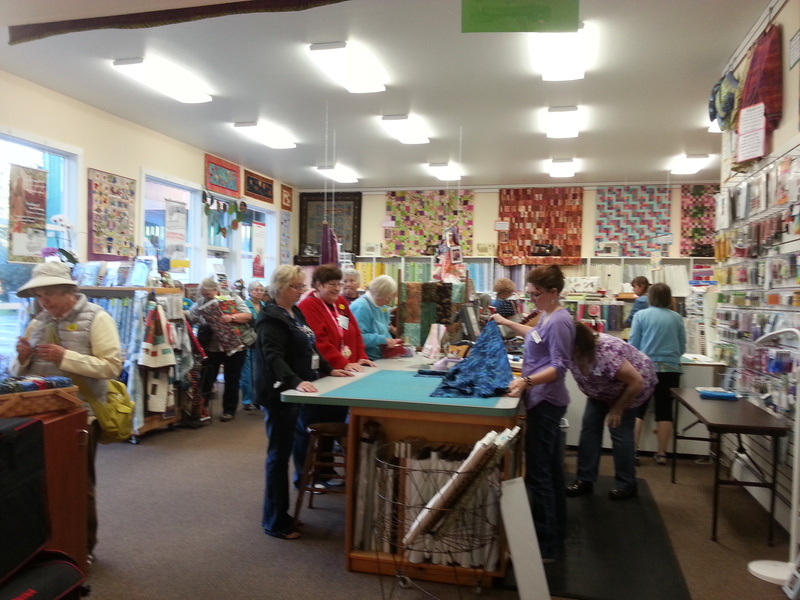 The premises are spacious including a large classroom. 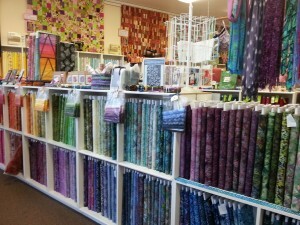 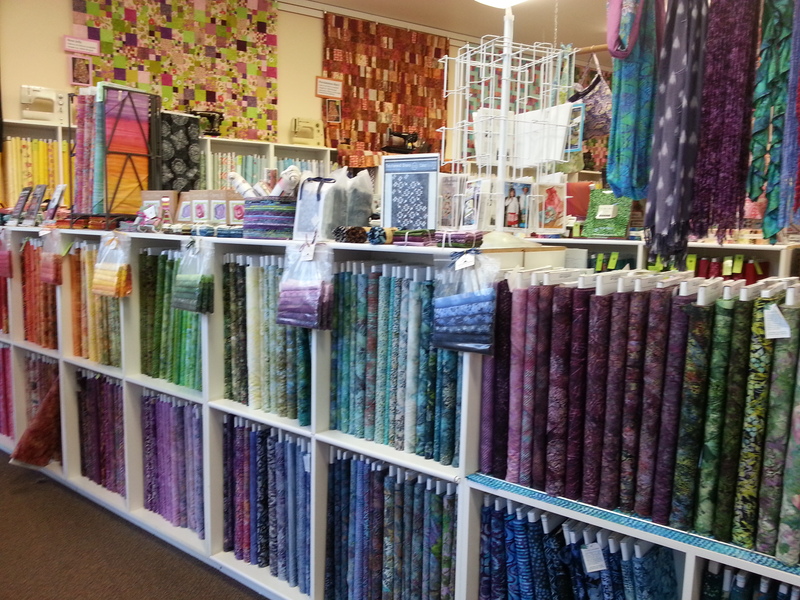 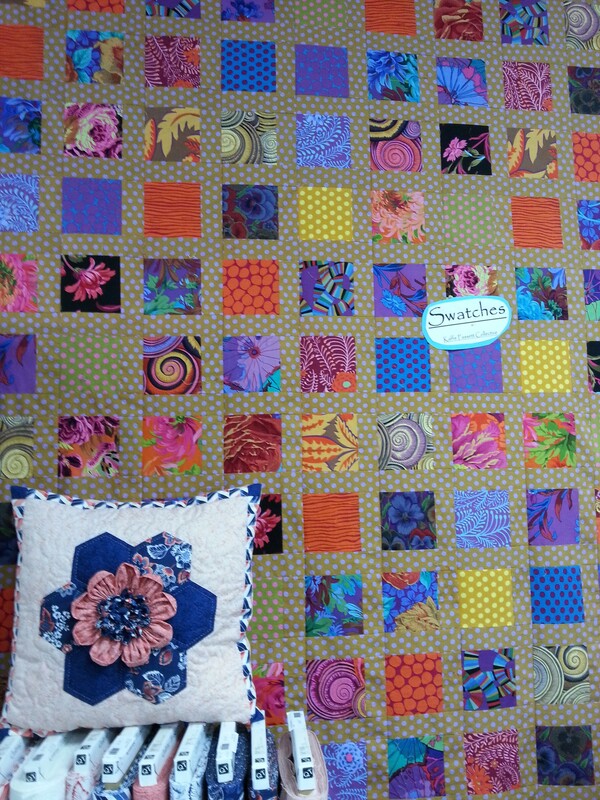 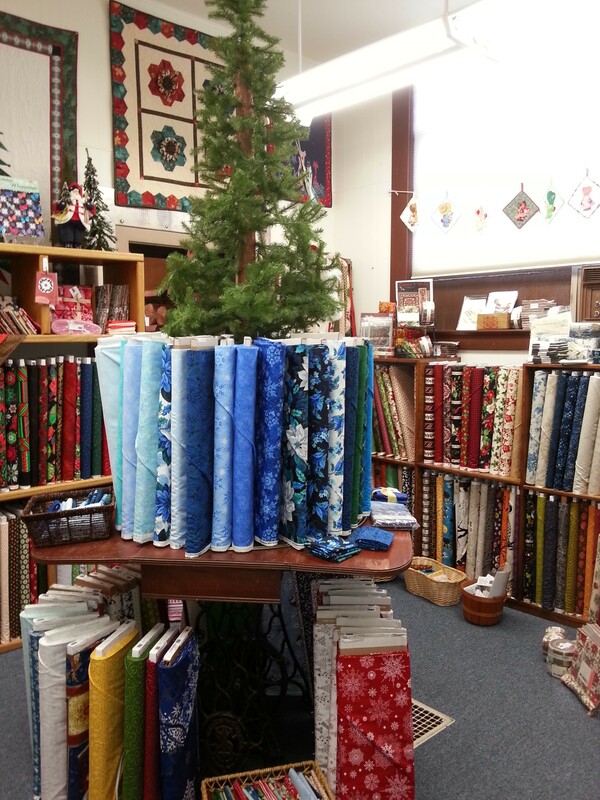 They are Bernina dealers and have a wide selection of quilting fabrics. 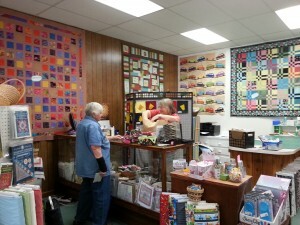 They stayed open late for us and gave us a warm welcome including some nice refreshments much appreciated after the excitement of the hump-backed whales. 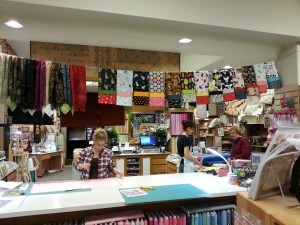 Our group was eager to shop, so it was win win all round! 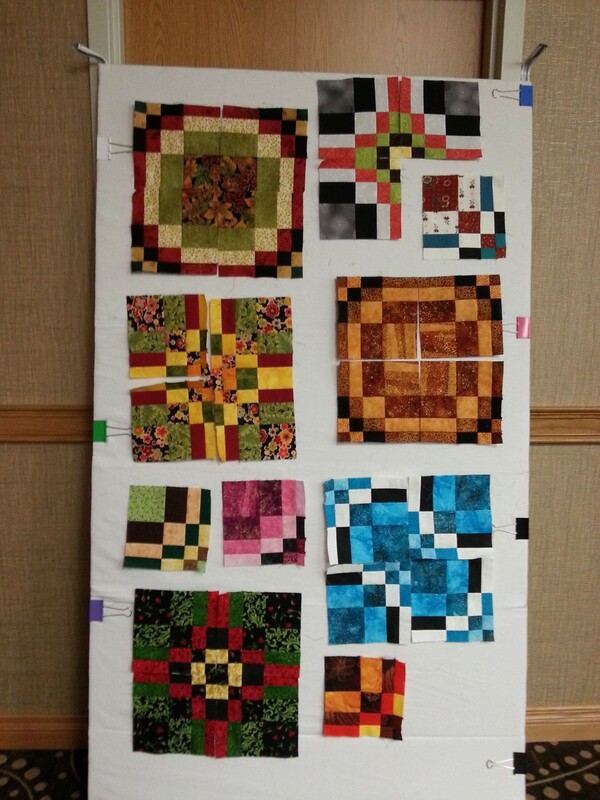 The class room featured several colorful quilts made from Kaffe Fassett fabrics and there was nice little section with felt for those interested in wool applique. 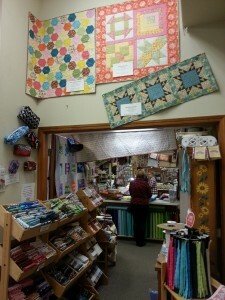 The store should be part of your bucket list if you make it to Juneau! 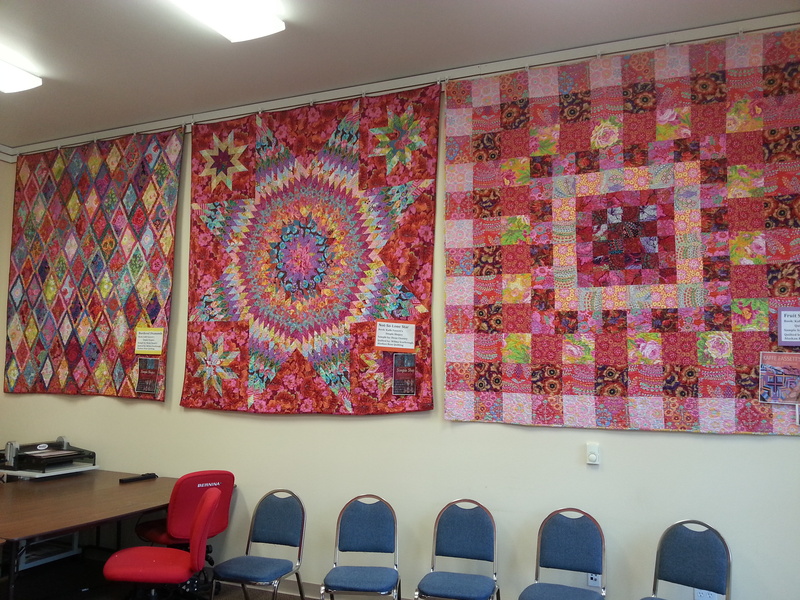 At the end of September, I traveled from west to east across Washington State to Spokane where I taught. 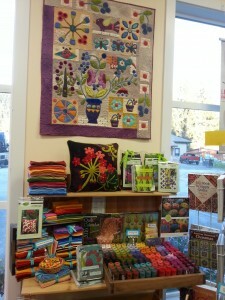 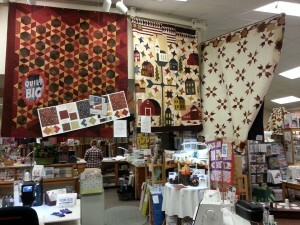 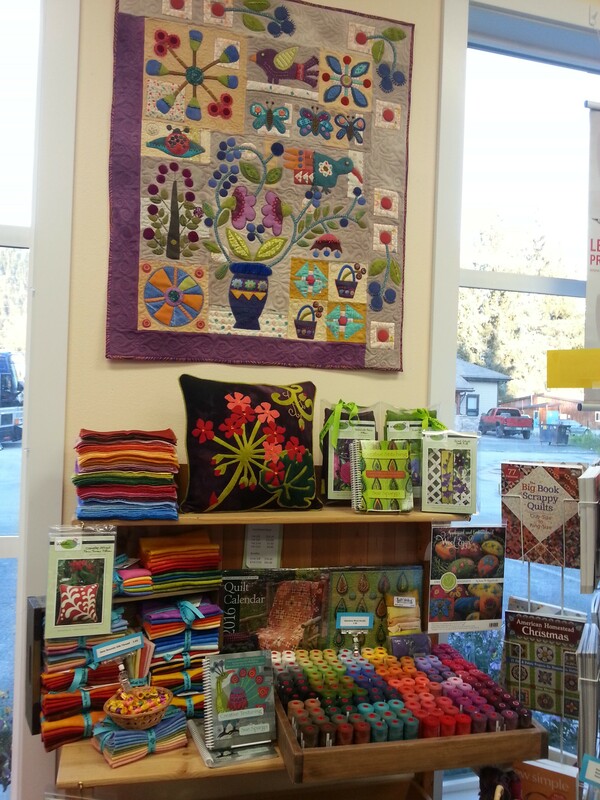 In Odessa on Highway 28, about an hour west of Spokane, I visited Experience Quilts located at 4 West 1st Avenue. 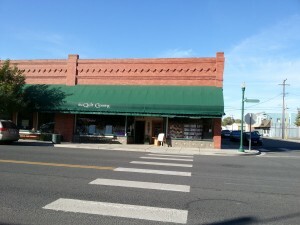 The store is on the main street through town and is easy to find. 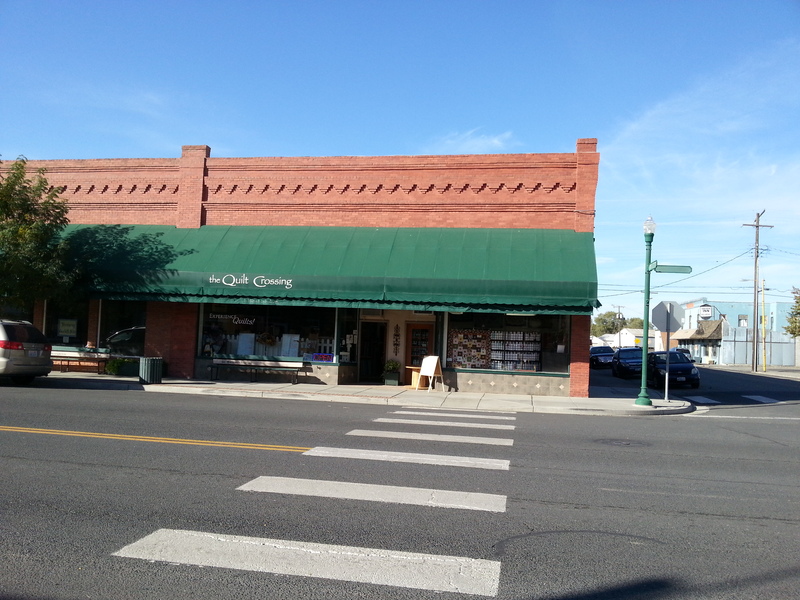 Don’t be confused by the sign on the green awning – it was formerly known as The Quilt Crossing! I received a warm welcome and enjoyed looking around. They offer long-arm machine quilting services, and have a classroom area with tables. 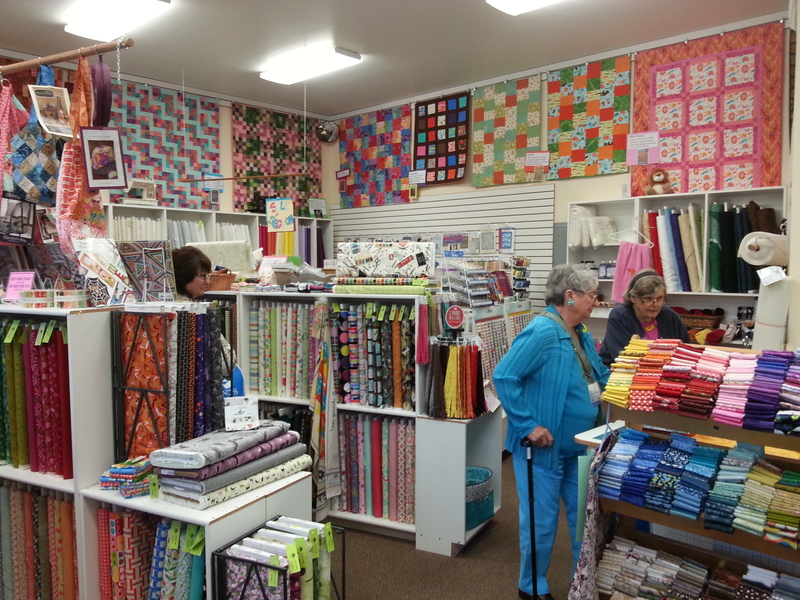 There was a good selection of fabrics, notions, patterns and books to provide for the quilters in this rural area of farmland and open countryside. If you are in the vicinity, its is worth taking the detour off Interstate 90. 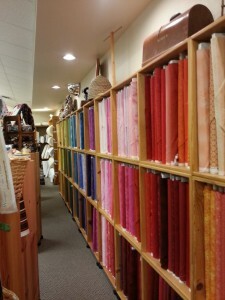 As you can see, they have a good quantity of fabric. 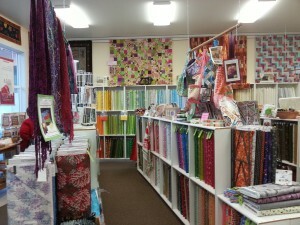 The shop is well lit and the merchandise is nicely organized so that it is easy to find what you want. 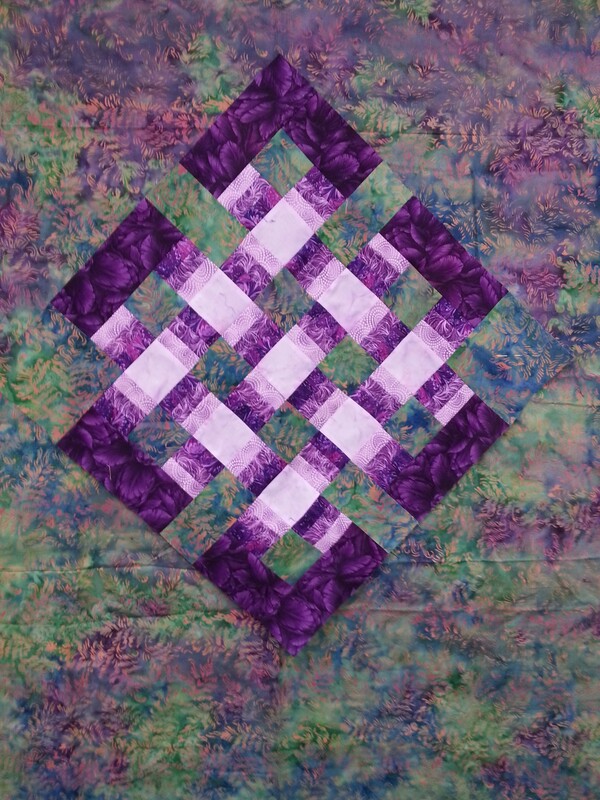 This quilt is a very simple pattern, but an attractive to way to use a variety of colorful prints or a charm pack. 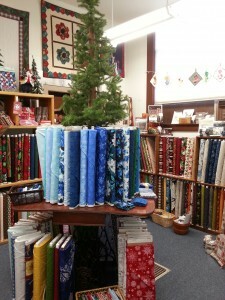 The store has a great selection of winter and Christmas themed fabrics too. 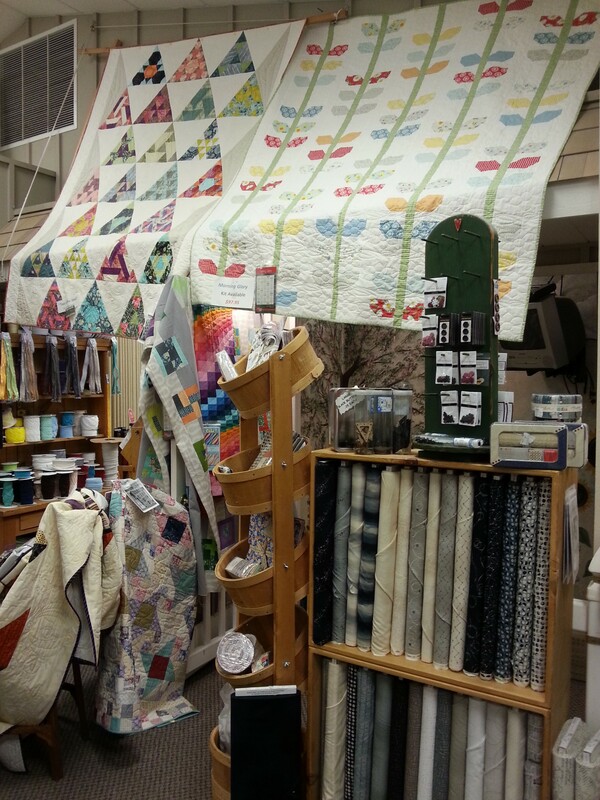 When I visited Spokane, I gave two lectures and taught two days of workshops for the Washington State Quilters, Spokane Chapter. 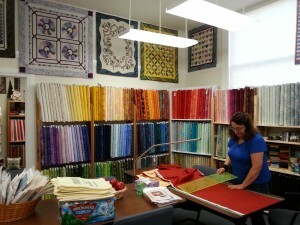 My wonderful hostess took extremely good care of me providing for my every need. 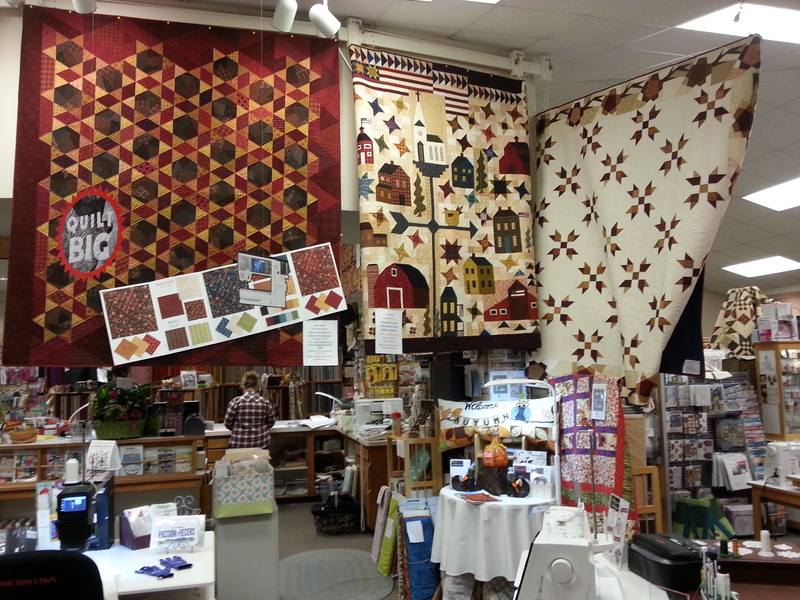 After one of the workshops, we walked around the downtown area of Spokane and had dinner, then headed out to The Quilting Bee, located at 12117 E Mission Blvd in Spokane Valley (just down the road from Spokane). 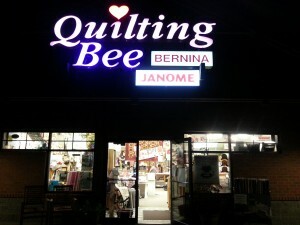 The store was open until 8:00 p.m. and the day we went, they were having a “Sew-in” until 11:00 p.m. 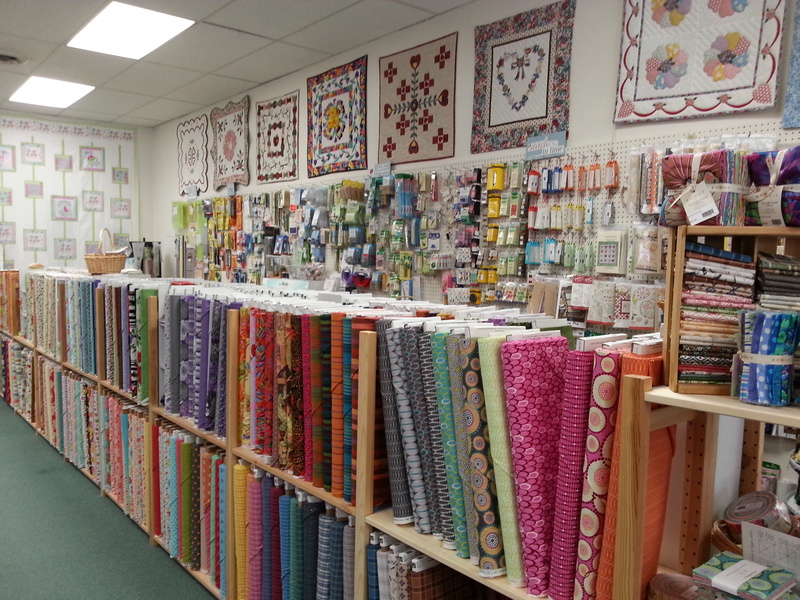 This large store can be a little overwhelming. 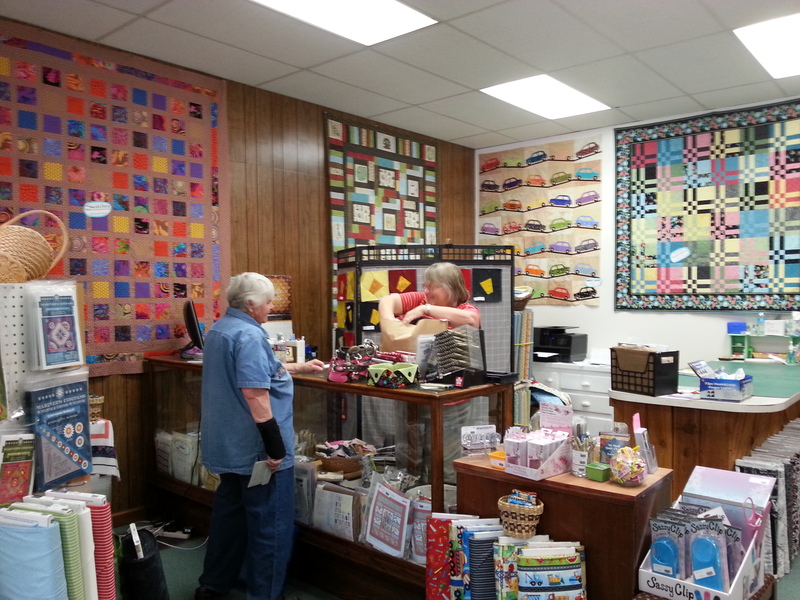 Every space is jam packed with merchandise and all the wall surfaces are covered with quilts and signs. 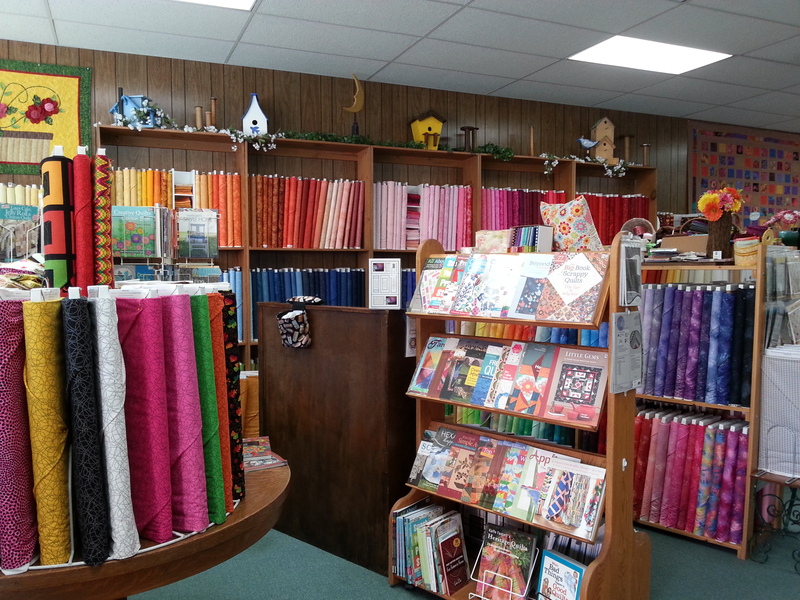 It can be a little hard to navigate in places as the passageways between the shelves are often narrow, but oh, there’s so much quilting stuff and samples to inspire! 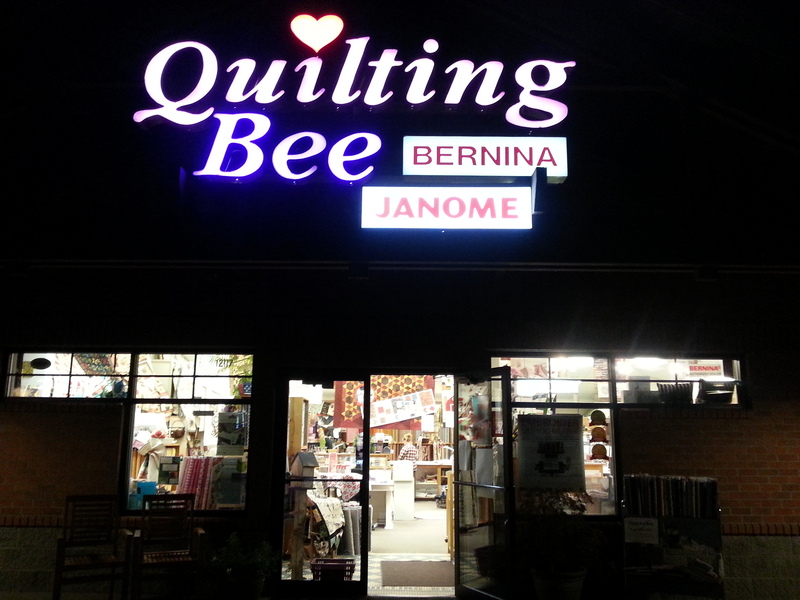 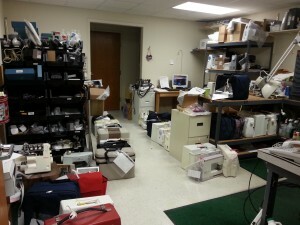 They are Bernina and Jenome sewing machine dealers and have on-site sewing machine mechanics. 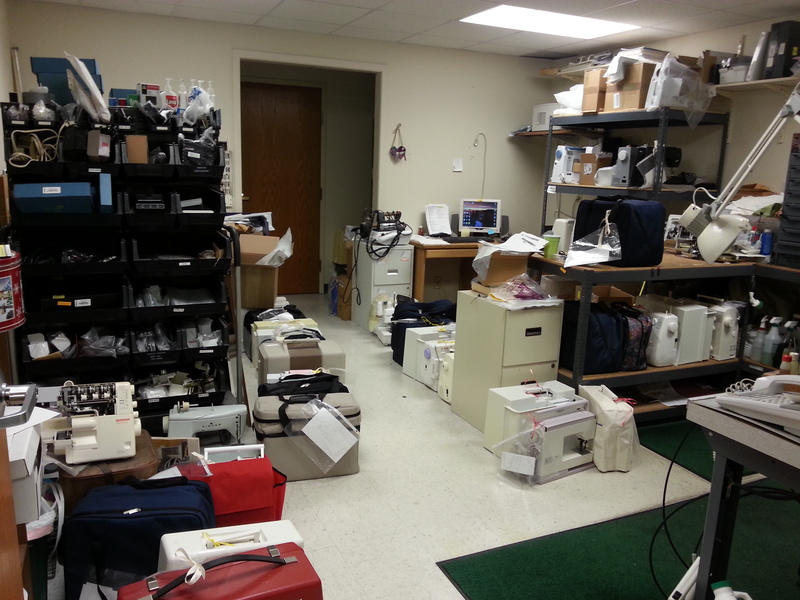 Downstairs, there is a machine repair shop, offices, a kit preparation and cutting room, and a large room for classes and meetings. 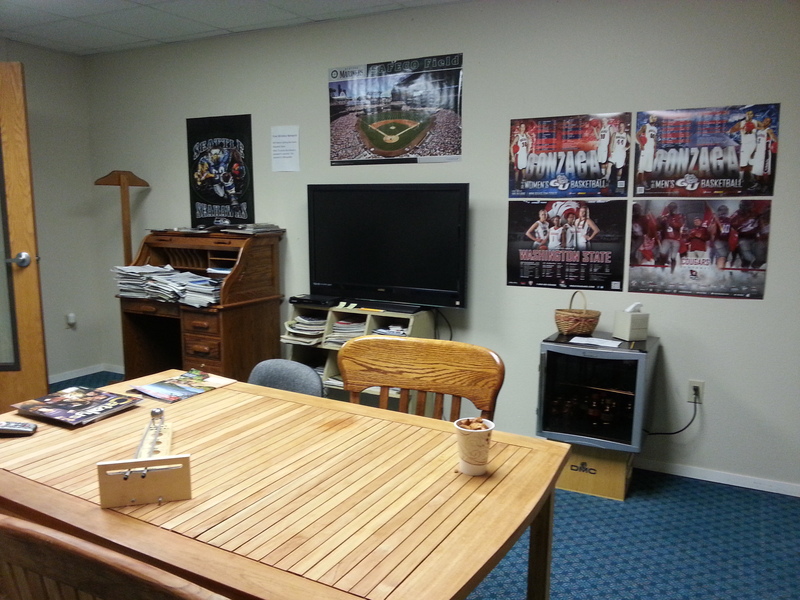 And check this out – there’s a man-cave complete with a TV, games, and sports magazines! 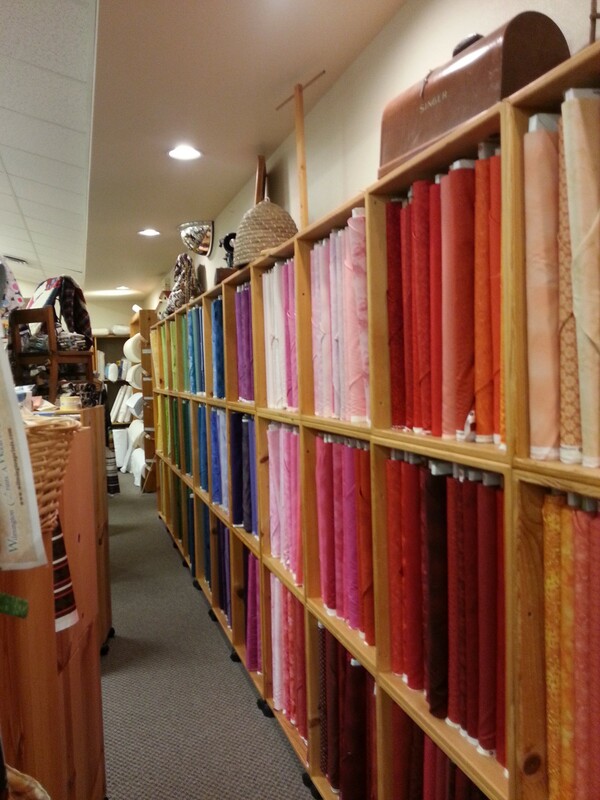 So, while the women are busy shopping, the guys can hang out and relax. 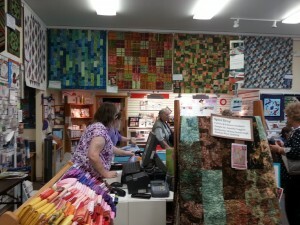 The store has a busy schedule of classes. 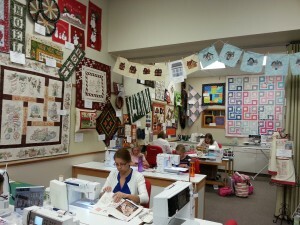 Here’s one of the classrooms with the evening sewers beavering away. 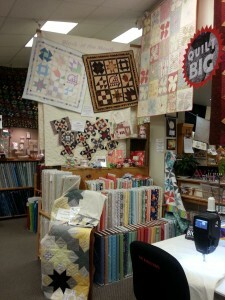 It’s not just about quilting. 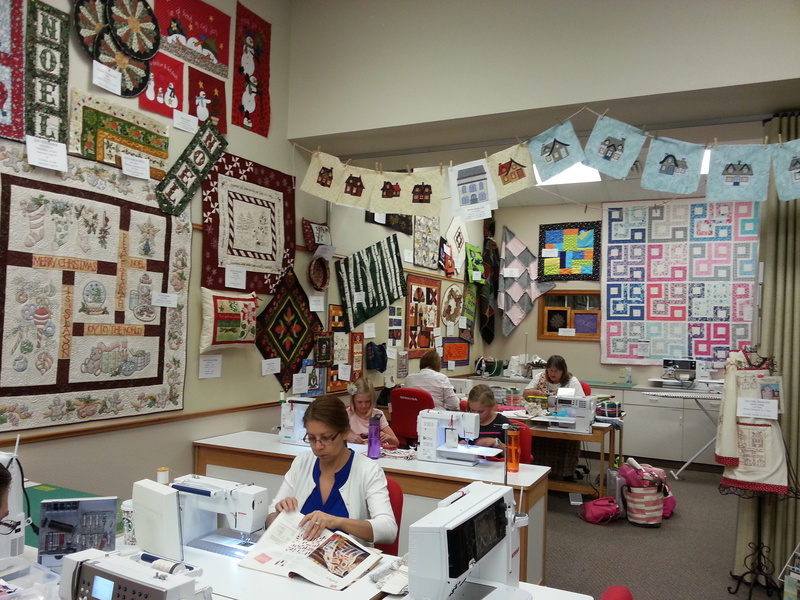 Classes include all kinds of sewing lessons, including projects for kids. It’s definitely a happening place that you will want to visit! 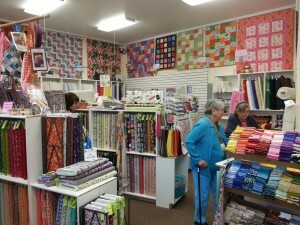 In September, I was given a warm welcome by the quilters of the Spokane Chapter of WA State Quilters. 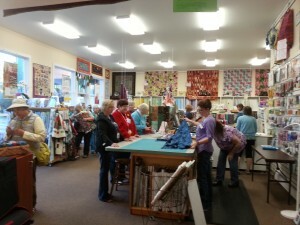 This is a large group and over 400 quilters attended my two lectures. 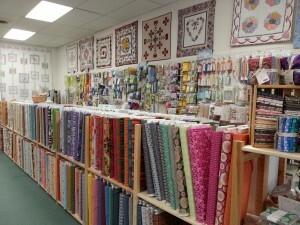 They were incredibly generous in their support of the Mongolian Quilting Center and we raised over $2,500 in donations and sales. 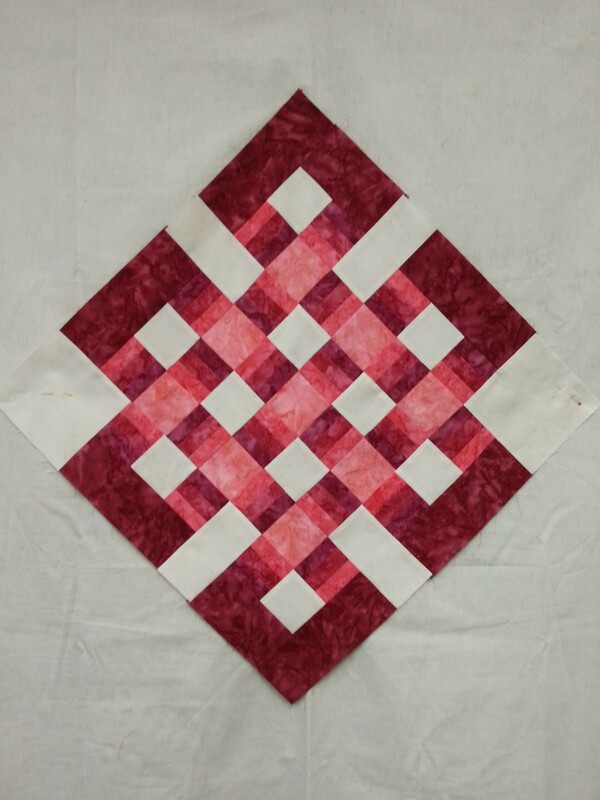 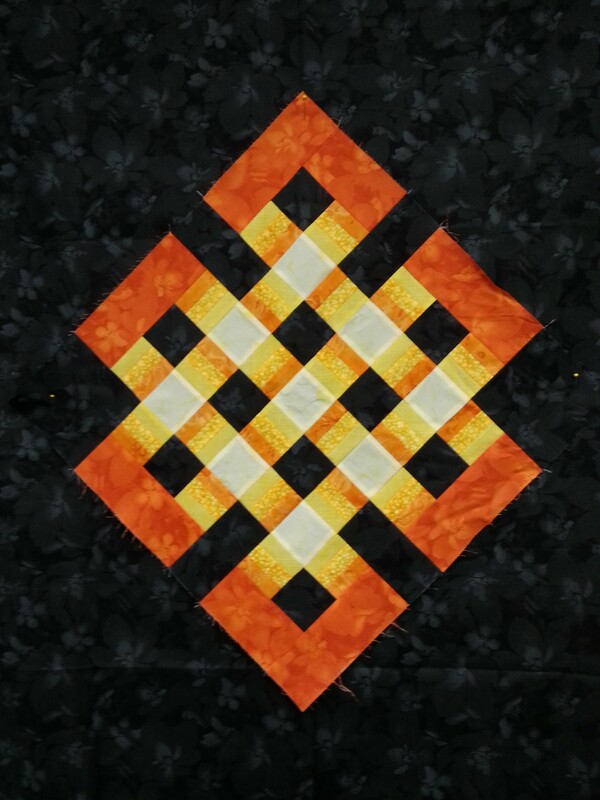 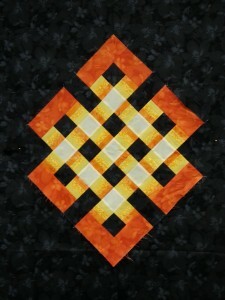 I taught two days of classes, Bargello Quilts with a Twist and the Gateway to Mongolia. 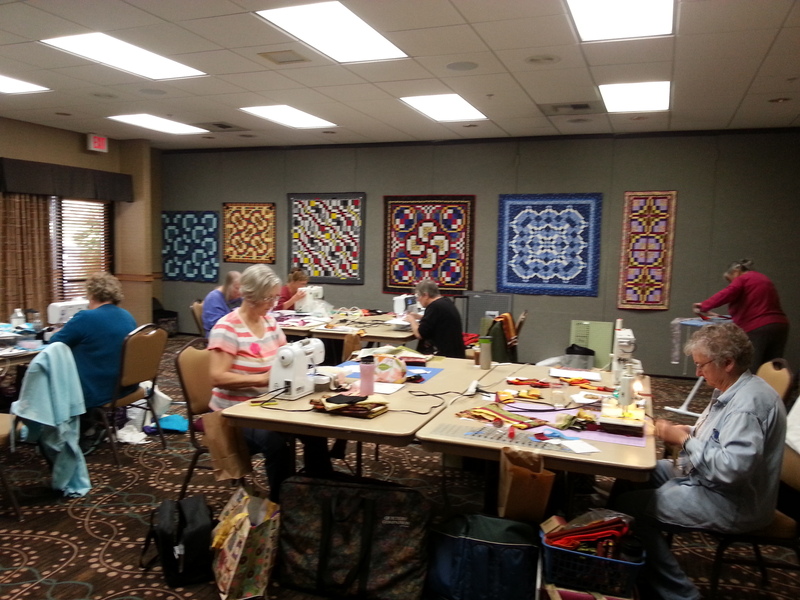 We had a nice light and spacious classroom at the hotel where I was staying, so it was very convenient and the hotel catered our lunches. As usual, I enjoyed seeing each student’s choice of fabrics and how these turned out in their projects. 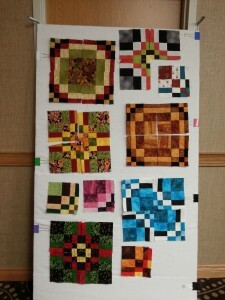 Here’s a selection of the Bargello blocks. 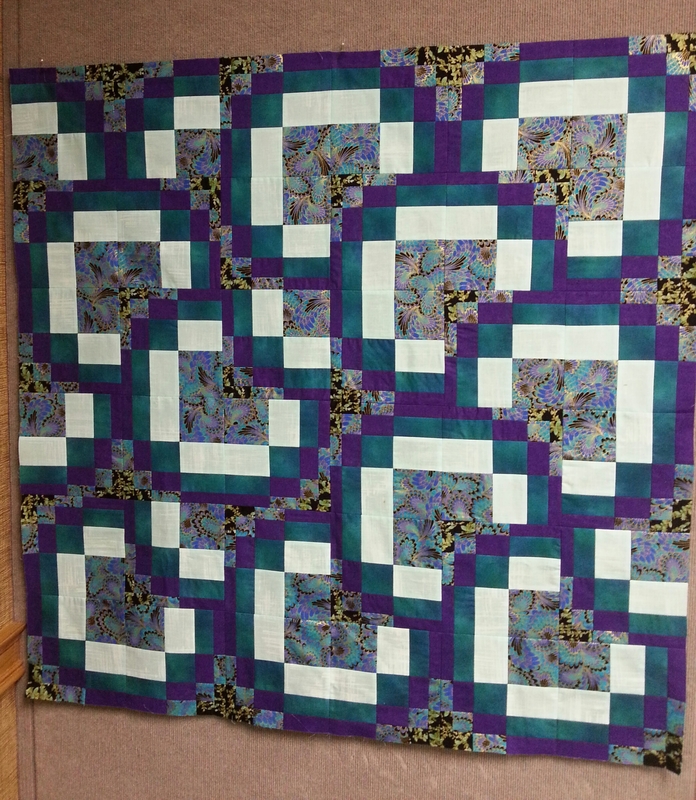 One of my students made a quilt top before coming to class! 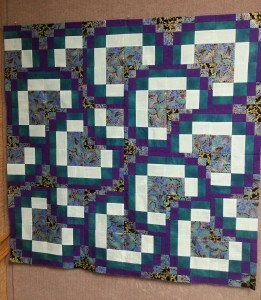 It’s always reassuring when people can successfully follow the directions in my book with great results. Here are some examples for the Gateway to Mongolia. They are all so different and it’s interesting to see how the Olzii pops out against the background. 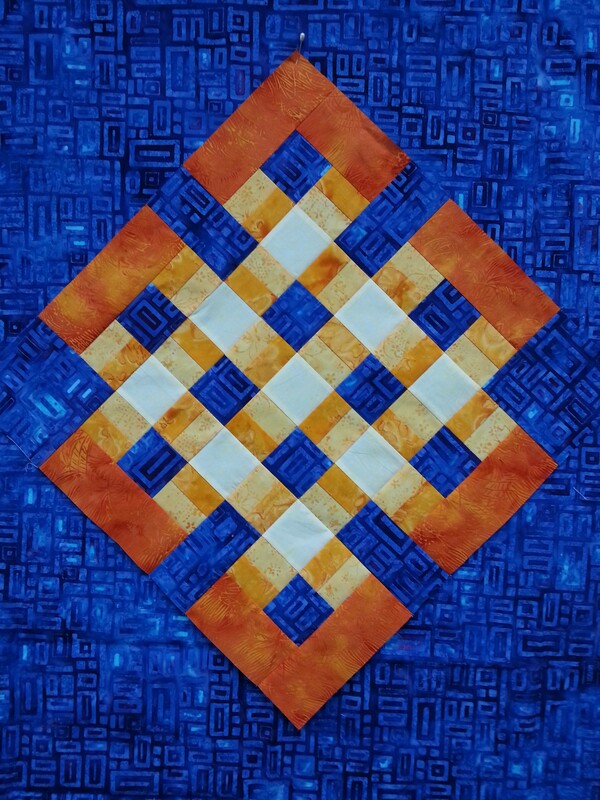 Some pop more than others and this class is a good lesson in the importance of value to get smooth transitions for achieving the woven effect.